Since December 7, 2016, the Vietnamese men’s national football team hasn’t lost a single game. Vietnam currently holds the longest active unbeaten streak in international football, according to Fox Sports. The last time Vietnam lost a match was in the semi-finals of the AFF Cup 2016. 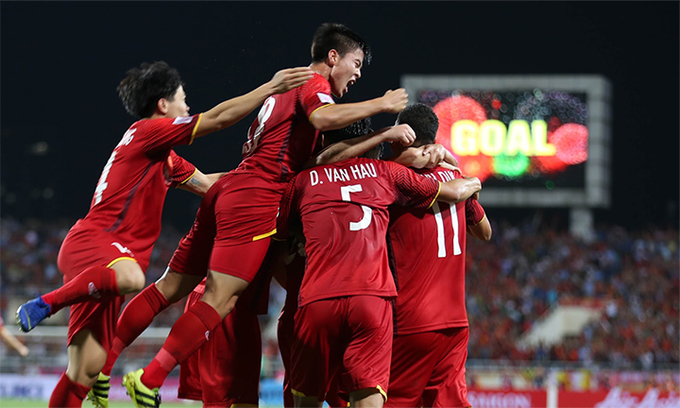 In particular, Vietnam’s national football team has gone unbeaten in 14 matches, with seven draws and seven wins. The longest active unbeaten streak previously belonged to 2018 World Cup winner France, who had 15 matches unbeaten under their belt before losing 2-0 to the Netherlands in UEFA Nations League on November 17 this year. "After yesterday’s defeat of France in the Netherlands, you cannot even imagine which soccer team has the most consecutive matches without losing anywhere in the world right now...", football expert Alexis Martin-Tamayo, who works for famous sports newspapers like ESPN and AS, wrote on Twitter at the time. In the AFF Cup 2018, Vietnam has won five matches and drawn one so far, conceding two goals and scoring 12. Vietnam will have the chance to extend their active unbeaten streak even further, as they will face Malaysia in both legs of the AFF Cup 2018 final this week. They had beaten Malaysia 2-0 in the group stage. The first leg will be played on December 11, at the Bukit Jalil Stadium Malaysia; and the second leg on December 15 at the My Dinh National Stadium in Hanoi, Vietnam.